AutoComplete monitors a RadTextBox and creates a list of values entered by the user. When the user returns to the RadTextBox at a later time, the list is displayed. Instead of retyping a previously entered value, the user can simply select the value from this list. Not all browsers support the AutoComplete feature. Check with your browser documentation to determine compatibility. To use the AutoComplete feature of RadTextBox, set its AutoCompleteType property. By default, the value of the AutoCompleteType property is "None". With this setting, the RadTextBox control shares the list with other RadTextBox controls with the same ID property across different pages. For any other value of AutoCompleteType, the RadTextBox shares its list with all RadTextBox controls that have the same AutoCompleteType value. To disable the AutoComplete feature, set the AutoCompleType property to "Disabled". Refer to your browser documentation for details on configuring and enabling the AutoComplete feature. For example, to enable the AutoComplete feature in Internet Explorer version 6 or later, select Internet Options from the Tools menu, and then select the Content tab. Click the AutoComplete button to view and modify the various browser options for the AutoComplete feature. This property cannot be set by themes or style sheet themes. 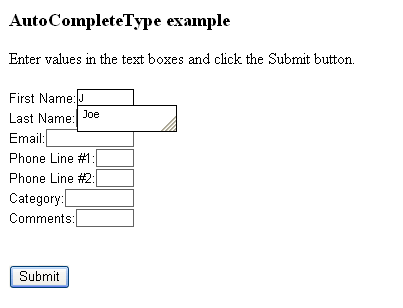 The following code example demonstrates how to use the AutoCompleteType property to specify the AutoComplete category for a RadTextBox control. This example has a text box that accepts user input, which is a potential security threat. By default, ASP.NET Web pages validate that user input does not include script or HTML elements. <telerik:RadTextBox RenderMode="Lightweight" ID="FirstNameTextBox" AutoCompleteType="FirstName" runat="server"
<telerik:RadTextBox RenderMode="Lightweight" ID="LastNameTextBox" AutoCompleteType="LastName" runat="server"
<telerik:RadTextBox RenderMode="Lightweight" ID="Phone1TextBox" AutoCompleteType="HomePhone" runat="server"
<telerik:RadTextBox RenderMode="Lightweight" ID="Phone2TextBox" AutoCompleteType="HomePhone" runat="server"
<telerik:RadTextBox RenderMode="Lightweight" ID="CommentsTextBox" AutoCompleteType="Disabled" runat="server"